January 19, 2016 - Atlas Air Worldwide Holdings, Inc. parent company of New York based cargo and passenger charter airline Atlas Air, announced today the company has entered into a agreement to acquire privately held Southern Air Holdings, Inc.
Southern Air Holdings, is the parent company of Worldwide Air Logistics Group and its two operating subsidiaries, Southern Air, Inc. and Florida West International Airways, Inc. 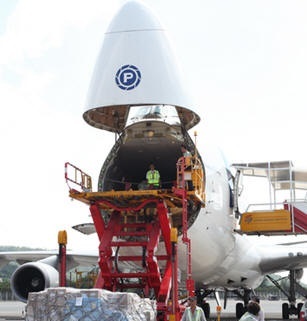 The purchase price of the Kentucky based air cargo services company, Southern Air Holdings is said to be an all-cash, debt-free transaction, valued at approximately $110 million. Atlas Air Worldwide intends to fund the acquisition of Southern Air using available cash on hand. The transaction provides Atlas Air Worldwide immediate entry into 777 and 737 aircraft operating platforms, with potential for developing additional business with existing and new customers of both companies. Southern Air's main operating company currently flies five 777-200Fs and five 737-400Fs under flight services (CMI, or Crew, Maintenance and Insurance) agreements with DHL Express, the leading global brand in the logistics industry. The platforms provided by these aircraft will augment Atlas Air Worldwide's ability to offer customers the broadest array of aircraft and operating services for domestic, regional and international applications. William J. Flynn, President and Chief Executive Officer of Atlas Air Worldwide said “We are very pleased to announce a strategically compelling, highly complementary and immediately accretive acquisition of Southern Air and we are eager to capitalize on the substantial opportunities that the transaction will provide, especially 777 and 737 aircraft operations.